The Philippine Airlines (PAL) Group is implementing a misguided new strategy that involves its budget airline subsidiary pulling off several domestic trunk routes. AirPhil Express, which is planning to be soon re-branded as PAL Express, has redeployed capacity from trunk to leisure and secondary routes, which it has taken over from PAL following a surprising decision by the Group that the two brands should remove nearly all overlap in their route networks. The move, implemented on 28-Oct-2012, goes against the grain of typical two-brand strategy at Asian airline groups, which have discovered that they can successfully use their LCCs to operate alongside their full service brand. As Philippine Airlines and AirPhil Express (soon PAL Express) brands cater to different sectors of the market, the two should be able to co-exist on trunk routes with minimal cannibalisation. Most crucially, PAL Group needs the second budget brand on domestic trunk routes to compete with rival LCCs. The Philippines has a crowded and intensely competitive LCC sector and it will be the Philippines’ four other LCCs that stand to gain the most as the PAL Group removes its budget brand from several of the country’s largest domestic markets. AirPhil continues to offer about 114,000 weekly domestic seats, giving the LCC about a 21% share of the Philippine domestic market. It remains the second largest domestic carrier and second largest LCC in the Philippines, behind market leader Cebu Pacific. But on 28-Oct-2012 AirPhil pulled out of seven major domestic routes from its Manila hub – Bacolod, Cebu, Davao, General Santos, Iloilo, Laoag and Tagbilaran. Five of these are among the 10 biggest domestic routes in the Philippines with Manila to Cebu, Devao and Iloilo being the three largest in the country. Five of these routes were also previously among AirPhil’s 10 largest routes (see Background Information). Note: *Market ranking is among top 30 domestic routes in the Philippines based on seat capacity for week commencing 29-Oct-2012. AirPhil prior ranking is based on top 10 domestic routes for AirPhil for week commencing 22-Oct-2012. Those routes not featuring in the top 10 are not ranked. See Background Information for the full list of the 30 largest domestic routes in the Philippines and AirPhil’s top 10 domestic routes for weeks commencing 22-Oct-2012 (prior to switchover) and commencing 29-Oct-2012 (after the switchover). PAL has added capacity in all seven routes dropped by AirPhil but in almost cases has not added as much capacity as AirPhil has dropped. 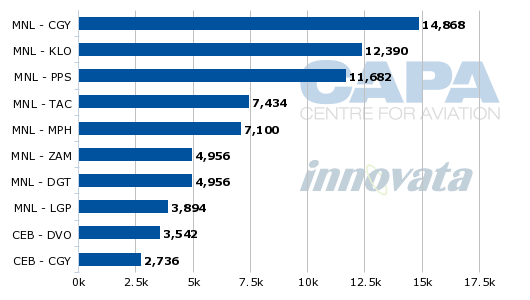 In some cases, the amount of capacity PAL has added is significantly less than the capacity AirPhil dropped, resulting in market share gains for PAL's LCC competitors. Overall PAL has reduced its domestic capacity by about 10% as the network changes were implemented, from about 106,000 seats for the week commencing 22-Oct-2012 to about 95,000 weekly seats for the week commencing 29-Oct-2012. While PAL has added seats on the seven routes dropped by AirPhil, this does not entirely offset the seats it had offered on the routes it has dropped and handed over to AirPhil. In addition, PAL reduced capacity on a few routes in which for now both the AirPhil and PAL brands continue to operate alongside each other. Note: ^New route for AirPhil Express *Market ranking is among top 30 domestic routes in the Philippines based on seat capacity for week commencing 29-Oct-2012. The routes PAL has dropped are smaller secondary routes or trunk routes which are leisure-focused and therefore have limited demand for premium or business passengers. For example while Manila-Puerto Princesa is the sixth largest domestic route in the Philippines, Puerto Princesa is predominately a leisure destination as it is the main airport serving the resort island of Palawan. The PAL Group determined that lower-cost AirPhil Express/PAL Express was a better fit for these routes than PAL as it aims to have just one brand on almost all domestic routes. AirPhil has significantly increased capacity on the routes that have been dropped by PAL and has launched services to Dumaguete and Dipolog to fill the void left by PAL. Damaguete is also a leisure destination near popular beaches and dive sites. There are only a handful of domestic routes now remaining that are now served by both the PAL and AirPhil Express/PAL Express brands. These could be handed to one brand – in most cases AirPhil Express/PAL Express – as part of a second phase. On 28-Oct-2012 AirPhil increased capacity on three of these routes – Manila to Kalibo, Tacloban and Legaspi – while PAL reduced capacity although for now maintains a small presence. Mainline PAL now accounts just 18% of total capacity in the Philippine domestic market, compared to almost 20% one week ago. The PAL Group now accounts for just under 39% of domestic capacity, compared to 41% prior to the implementation of the network changes. Four other LCCs operate domestic services in the Philippines and account for the remaining 59% of the market, led by Cebu Pacific with a 46% share. With the implementation of the northern hemisphere winter schedule, Cebu Pacific’s domestic capacity has increased by 4% according to Innovata data, resulting in a 2ppt rise in its capacity share. The Philippines has the highest domestic LCC penetration rate in the world, about 80%, among major domestic markets. The Philippines had about 11 million domestic passengers in 1H2012 with LCCs accounting for 79% or just nine million passengers. Cebu Pacific, Zest Airways and Tiger Airways affiliate SEAir are the main beneficiaries of the network changes at AirPhil as there is now one less competitor in the markets AirPhil has dropped. The Philippines’ fifth LCC, AirAsia Philippines, will only benefit marginally from the network changes as it only operates from Manila's alternative airport Clark, and serves only one of the seven affected markets, Davao, with one daily flight. AirPhil predominately operates out of Manila International but earlier this year launched three low frequency domestic routes from Clark – Cebu, Kalibo and Puerto Princesa – which are being retained as PAL does not operate at Clark. AirAsia Philipines now competes against AirPhil in all three of these markets although it is dropping Clark-Puerto Princesa service on 30-Nov-2012. Cebu Pacific also predominately operates from Manila and has only one domestic route from Clark, Cebu, while Zest only serves Manila International. Consolidation in the Philippines market is seen as inevitable given the intense competition and resulting over-capacity, which was exacerbated when SEAir in 3Q2012 became the fifth LCC to operate domestic trunk routes. Manila to Cebu, Davao and Bacolod were among the seven domestic routes launched by SEAir in late Jul-2012 and early Aug-2012 as additional A320 family aircraft were delivered from part-owner Tiger Airways. It is unlikely these markets could have continued to support so many competitors. 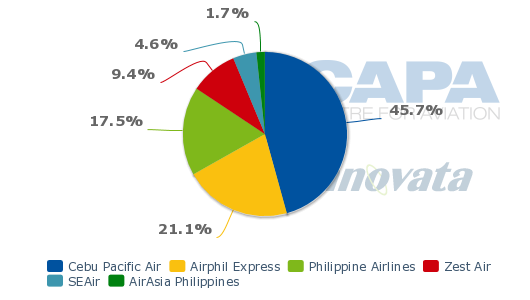 But AirPhil, as it is backed by PAL, was seen along with market leader Cebu Pacific as the strongest players. By exiting these markets, AirPhil is essentially handing market share to its LCC competitors and significantly improving their outlook. There could still be consolidation in the Philippines as markets such as Manila-Iloilo may be unable able to support three LCCs. But it is certainly a better scenario than having four LCCs competing directly. Meanwhile, the network changes at AirPhil have left Cebu Pacific as the only LCC linking Manila from General Santos and Laoag. It is likely SEAir and/or Zest will seek to fill the void left by AirPhil in these markets. SEAir also currently does not serve Taglibaran but may now be tempted to include this relatively large market in 2013, when it is expected to pursue further fleet and network expansion. The decision by the PAL Group to have PAL become the only brand in seven key domestic markets is puzzling and according to PAL Group sources has raised eyebrows within the group. The change in strategy was made by PAL Group’s new owners San Miguel, which took a majority stake in both PAL and AirPhil in Apr-2012, following a recommendation made by LEK Consulting. Originally San Miguel was expected to retain the previous two-brand strategy at PAL Group, which has been in place since Air Philippines was branded as AirPhil Express in early 2010 and adopted the LCC model. The PAL Group has since used AirPhil to operate alongside the PAL brand on trunk routes where there is a mix of business and leisure traffic, with AirPhil steadily expanding its fleet of A320s while PAL has gradually been shrinking its domestic operation. AirPhil has added five A320s over the last year, giving it a fleet of 13 A320s along with eight Bombardier Dash 8 turboprops. Having its two brands serve major trunk routes where there is a mix of business and leisure traffic made sense as PAL was able to focus on premium and connecting passengers while AirPhil was able to focus on point-to-point budget passengers. This two-brand strategy, in place at PAL since 2010, was similar to the successful strategy at two-brand pioneer Qantas Group, which has had its LCC brand Jetstar complement Qantas on several domestic Australia and international routes for several years. It also follows the strategy at Garuda, which is now using its fast-expanding Citilink subsidiary alongside the Garuda brand on main trunk routes. Singapore Airlines and Thai Airways short-haul low-cost affiliate carriers Tiger Airways and Nok Air, respectively, also operate alongside the full service brand. As it has a higher cost structure than AirPhil, PAL will struggle to compete against LCCs in the point-to-point market. As the only full service and network carrier in the Philippines, PAL should retain a presence on major domestic routes, particularly in those markets that have some demand from premium passengers. But PAL should not be afraid to have its AirPhil brand continue to operate in these markets as the LCC subsidiary caters to a different profile of passengers and is a more effective competitor against LCCs. PAL Group sources say AirPhil was making money on domestic trunk routes including Manila-Cebu and Manila-Davao while most of its smaller routes have been unprofitable. Sceptics of the new strategy within the PAL Group expect PAL will struggle to compete against its LCC competitors on the trunk routes and say there could be a push to reverse the current strategy and put AirPhil back onto trunk routes once it becomes clear these routes have become less profitable. On the secondary and leisure domestic routes, the switch to AirPhil is logical as the group looks to reduce its losses in these types of markets while maintaining service. While these routes will likely remain in the red, the losses incurred by AirPhil should be less than the losses incurred by PAL. On the secondary routes being dropped by PAL, Cebu Pacific is now the only competitor and giving Cebu Pacific a monopoly is not an acceptable proposition for the PAL Group. PAL has struggled to compete against Cebu Pacific on these routes as nearly all passengers in these markets are budget-conscious. Switching to AirPhil’s all-economy product and lower cost base should reduce the losses. The routes cannot be abandoned altogether as they have some value to the group’s overall network. PAL will still be able to offer connecting services onto its international network for passengers from these smaller markets through a codeshare with AirPhil. The two PAL Group carriers have already been codesharing but previously the codeshare was limited to a one-way block space agreement only covering AirPhil-operated turboprop flights. The Group is now working on expanding the AirPhil-PAL codeshare to include AirPhil-operated jet flights, including on routes PAL has dropped. It will also be extended to include PAL-operated flights, allowing AirPhil to continue selling tickets on the trunk routes it has dropped. The two carriers will also start codesharing on a free-sale rather than more restricted block space basis. PAL and AirPhil have both just migrated to a common IT system from Sabre, which allows the two carriers to easily implement a two-way free-sale codeshare across their domestic networks (and their international networks if they see a need). AirPhil initially took over PAL’s turboprop routes and fleet Bombardier Dash 8s in 2008. The operation was initially branded PAL Express until the current AirPhil brand was adopted in 2010. The PAL Group is now waiting for regulatory approval for AirPhil to readopt the PAL Express brand, which will cover both the turoboprop and jet operations. The AirPhil turboprop operation, which primarily links Manila with regional airports which cannot accommodate jets, will be maintained as part of the revised strategy. Cebu Pacific also operates a fleet of ATR 72 turboprops as several high demand markets in the Philippines are not suitable for jets due to runway length limitations. For example, Caticlan, the gateway to the popular resort island of Boracay, can only accommodate turboprops but high frequency operations from Cebu Pacific and AirPhil make Manila-Caticlan the ninth largest domestic route in the Philippines. None of the other routes which Cebu Pacific and AirPhil now compete on with turboprops are among the top 20 routes in the Philippines. The two carriers are also the only competitors on several point-to-point secondary jet routes from Cebu, the second largest city in the Philippines. More point-to-point flights from Cebu and other regional centres such as Davao and Iloilo have been the focus of Cebu Pacific as congestion at Manila makes further expansion at the capital difficult to pursue. Unlike Cebu Pacific, AirPhil is predominately a domestic operator. 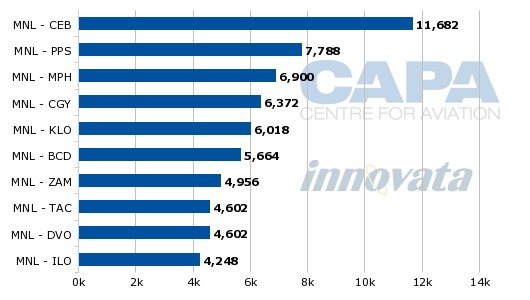 Currently 94% of the carrier’s seat capacity is allocated to the domestic market. The carrier now only operates scheduled services on five international routes, according to Innovata data. While AirPhil is planning to expand its international network, with a focus on routes which PAL does not currently operate, the airline is expected to remain a major player domestically. Further domestic expansion could occur if PAL realises it has made a mistake in removing the AirPhil brand from seven important domestic markets. Given the drastically different strategic direction other airline groups have taken in the Asia-Pacific region, and the intense competition among LCCs in the Philippine domestic market, it seems inevitable PAL will again adjust its two-brand strategy. When it does, growth will be further accelerated at AirPhil/PAL Express as the budget brand will likely resume service on all trunk routes while remaining the only brand in secondary and leisure-focused routes. PAL and its new owners the San Miguel Group need to recognise nearly all the growth in the Philippines is at the lower end of the market and pay attention to the successes and mistakes of its peers. Citilink, for example, was initially used on secondary routes before Garuda realised it had made a mistake and needed to use its budget brand alongside the main brand on trunk routes to compete with LCC Lion Air, which became Indonesia’s largest domestic carrier in 2009. PAL is in a similar situation with an LCC, Cebu Pacific, as a larger competitor. While the group is fortunate to have new owners with deep pockets, PAL cannot afford to continue to make strategic mistakes. It should reconsider its latest network adjustments and reverse the changes before it loses more ground to its LCC competitors. This is the first in a two-part series on the new PAL Group Strategy. The second part will look at the group’s two-brand strategy for the international market.